I'm so glad that I joined Sarah Mae at Like a Warm Cup of Coffee for her 12 New Things. It will help me to stay focused on what I want to do! I came up with my list of 12 new skills I wanted to learn or grow in. For August, I wanted to help myself continue to grow in the skill of reading. I barely read anymore and last year I followed my friend Charlotte and made a list of 12 books to read in 12 months. Well, I still have 3 books to go though I will have 1 more finished by the actual end of August, leaving 2. Technically I didn't start my 12 months until 9/16 of last year so I will use the additional 2 weeks to try my best to finish those last 2 books! I can tell you that I never would have read the 9 books I have completed without that list! My new thing for August was to create another list of 12 books in 12 months to read. 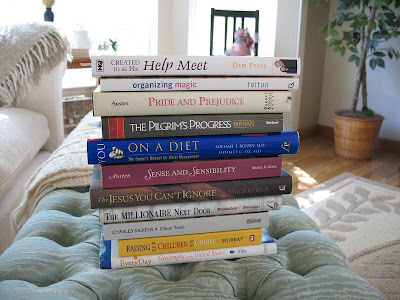 I used my same criteria as last year: a combination of books to help me as a Christian, as a homemaker, and just for literary enjoyment plus they all had to be right here in my home already! Why books that I already own? Because I have had a habit over the years of purchasing books that I didn't read (like the book Do It Now that I had for years, but never read - *ahem*) or started but never finished and want to make use of those books so that I can then donate some of them. August: Finish reading last year's 12 in 12 list (3 to go). September: Created To Be His Help Meet by Debi Pearl - Have already started this one and am really enjoying it. There are some very good lessons for me! October: Organizing Magic by Sandra Felton - Well an unorganized person can dream, right? November: Pride and Prejudice by Jane Austen - Thought I should go back and read the book after several years of just watching the movie! January: You On a Diet by Roizen & Oz, M.D. 's - I started this book a long time ago and it seemed to have some interesting info on how your body works. March: The Jesus You Can't Ignore by John MacArthur - Hubs read this and liked it so I look forward to it. April: The Millionaire Next Door by Stanley & Danko, Ph.D.'s - Had this book for years and years but never finished it. I think a lot of things have changed by now, but I'm guessing that there are still some good bits of financial wisdom. May: Oliver Twist by Charles Dickens - Never read it, which surprises me. So I shall! June: Raising Your Children For Christ by Andrew Murray - I need all the advice I can get! July: Everyday Geography of the United States by Barbara Fifer - An older book, but it has some info about each state. I'll read it aloud so my son can learn a little something too (we enjoyed doing that this Summer with a church history book). The 12 New Things also inspired me to come up with a list of 12 projects to complete (because they kept appearing on my brainstorming list for 12 new things)! Each month on my sidebar (it says August Accountability right now), I'll have a little section telling you what new thing I'm learning, what project I'm completing, and what book I'm reading. My August project is to set up a reminder system through e-mail for all the birthdays/important events through the year (not complete yet). I'm excited about this because it's already helping me be more accountable! Do you have 12 New Things to learn? It's not too late to join up. We're linking up our August things today at Like a Warm Cup of Coffee, but you can always come up with your list and get it posted or link up next month (the last Thursday of the month). Even if you don't have a blog, this is a great time to sit down and make a list of some new things to learn. Did you learn a new skill this month? Thanks for joining me and have a great day friends! You know, I'm not much of a reader, but I've discovered some of these classic books as free audio books at librivox.org. I just finished Pride & Prejudice about 10 minutes ago. I started reading Emma a while back but, in normal fashion for me, have not finished it yet. It's a wonderful way for me to get a taste of these classics while I multi-task and work at the same time. u go girl! Get your "read on"! I so gave up trying to read books just for myself. LOL! Though back in the day I've already read Created to be his Help Meet and Pride and Prejudice. Do you want cliff notes? LOL! I know some day I'll get to read for myself again without falling asleep after reading a paragraph. Big reading time is sleepy time size hugs to you!!! I love this idea!! I am an avid reader and do book reviews so I read a lot, but the 12 projects and new things, Love it!! I have read a few of your books and have to say I think you will love them. The Millionaire Next Door I read about a year ago. It is a slow read in parts but has a ton of great info. My husband's boss, who is a Christian and a millionaire, told us he read this when he was young and has since made his kids read it. He says you will be successful financially if you follow the advice in this book. Enjoy your books and I look forward to those projects!! So I read about the same amount as you this last year....9 out of 12 books. I am going to be starting a challenge in September that is a bit different, and since I can't do too many things at once I am going to take a break from the 12 in 12. But that doesn't mean I will stop reading! I would love to hear what you think of Created to Be His Help Meet and that geography book sounds really good too.